Take the best care of your small engine with VP. Known as a world leader in race fuel technology, VP has a reputation for quality, superior service, technical support, and is the Official Racing Fuel of the NHRA Championship Drag Racing. In Stock & Available For Pick Up! What Happens in a Gas Tank? Do you know how destructive ethanol can be on carburetors and fuel systems? Ethanol is meant to break down debris and gunk in fuel tanks, but, by doing this, small particles clog in fuel lines and carburetors. The abrasive nature of the chemical degrades and pollutes gas-powered engines – the smaller the engine, the bigger the problem. When you couple these damaging elements with winter or summer storage, you get even more casualty to your tools. Ethanol absorbs moisture that permeates into your tank and then separates from the gasoline. This leads to insufficient lubrication in the engine and degrading rubber and plastic components throughout the system. Expertly developed and formulated, VP Small Engine Fuel is an ethanol-free alternative to fuel your small engine tools. We use the highest quality components made by VP Racing Fuel team to ensure your engine experiences longevity, peak performance, and optimum protection. VP is world-renowned for their technologically superior race engines and is skilled not only in the art of engines but in science and engineering. With these stepping stones, they created molecular technology that lent itself to VP Small Engine Fuel. Rest assured with the science and technology that was tried and tested by the professionals and brought to our everyday working professional. You need your equipment to be there for you when you need it most. Don’t risk engine failure or difficulty with start-ups when there is such a simple solution. 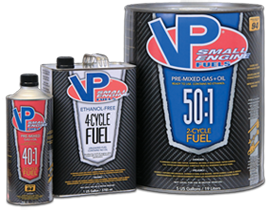 VP Small Engine Fuel will prevent costly repairs, extend the life of you equipment, and provide you peace of mind. Know that your trusty tools will always be there for you. The results are clear: when you substitute traditional gasoline with VP Small Engine Fuel, your engines work better. You get more sensitive throttle response, your engine starts easier, and your equipment runs smoother, more efficiently, and cleaner. For your seasonal tools and engines, you need to ensure that you take the proper care to winterize the equipment that takes care of you. VP Small Engine Fuel provides protection to your machines. It is a stable fuel that can remain sealed indefinitely without fear of degrading plastic, rubber, or fiberglass in your equipment’s inner workings. Wondering what happens when you use it? Pull a cord, push the start button, and go – it’s ready to go when you are. Think you can get away with putting in an additive? Think again. Fuel stabilizers are not enough to properly protect your engines. Ethanol will still be present in the fuel and still wreak havoc on your equipment. The only proper solution is switching out the ethanol-laced fuel with VP Small Engine Fuel. Choose VP Small Engine for your fueling needs. Not only does it protect your engines from costly repair, but it prevents future damage, promotes longevity, and increases performance. VP Small Engine Fuel: the only fuel for small engines.